Premier Realty Limited and the Kenya USA Diaspora Sacco (KUDS) continue to work hand in hand in a bid to provide members and other Kenyans in the USA Diaspora with more viable and lucrative land investment opportunities. The successful completion of a number of key projects has once again led to the birth of another unique offering: Premier Mews Estate. The first step to constructing your desired home is to buy land in a strategic location that has the potential for growth both economically as well as property value. 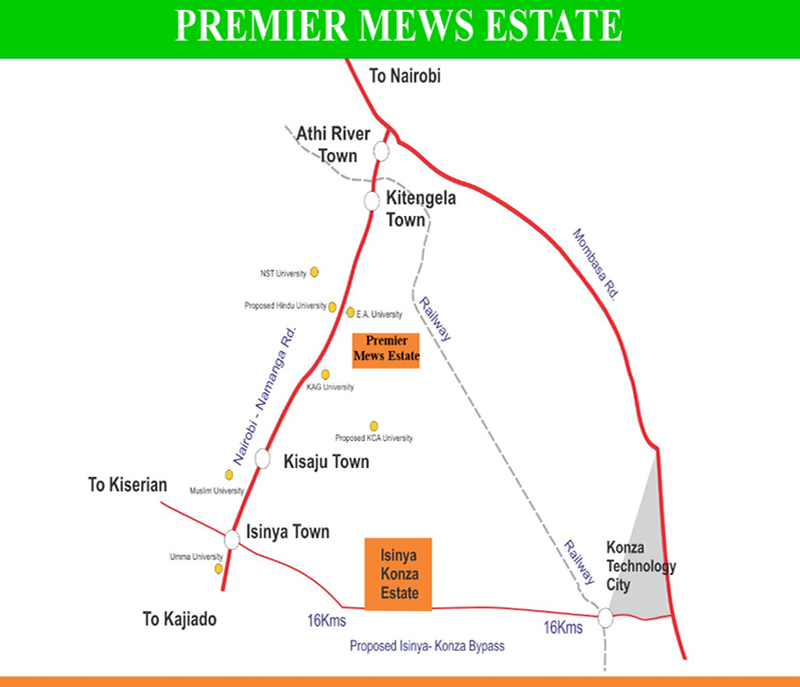 Premier Mews Estate sits on a 22-acre piece of land and is located in Korompoi area of Kitengela (Kajiado County). The parcels are a mere 2.5KMs away from the Nairobi – Namanga highway or 7.5 Km from Kitengela Town. They are surrounded by major social amenities such as the East African University, Kampala International University, RAF University and KAG University. The neighboring area boasts of upcoming housing developments owing to the existence of borehole water, electricity, and other services that are necessary for human settlement. It is, therefore, very ideal for anyone planning on buying and building a home immediately. Owing to the factors mentioned above, the land also provides investors with great prospects in regard to purchasing land and developing residential homes for the university community. What do I need to purchase a plot? How do I select a plot? You may call the Sacco office on +1-678-398-7728 and ask for assistance in plot selection and if you've already made your selection, call the office with your details to pay $50 plot booking fee. You will then be advised on the next steps with your plot purchase. If you're paying CASH or using the 1-month to 10-month instalment option, the tables below summarizes all the monies you will need to pay before your title is processed i.e. the legal fees, stamp duty and costs associated with transfer of the title into your name. Title deed transfer processing period will depend on how soon you complete your payment, submit the necessary documents, sign the sales agreements etc. It can take anywhere between 1-3 months to get your title. Once the title is ready, the Sacco delivers it to your doorstep in the United States or as per your request. Absolutely YES! The Sacco is offering up to 100% financing on the cost of the land. The cost of land using a loan is KES 950,000 for 40*80 and KES 1,800,000 for 1/4 plot respectively. The loan amount will be based on how much you have in your Sacco savings or up to x4 your Sacco savings. Your plot will serve as the collateral for the loan. * Note the above discounted legal fees and disbursement for charging a property is based on your loan amount and ONLY apply if borrowing towards these plots. For all other Sacco loans, different terms & fees apply.